Hostal Marsella tiene una política de cancelación del 30% no reembolsable del depósito que el cliente paga inferior a 7 dìas de anticipación. Adicional a esto no es reembolsable la comisión de Hostelworld.com por políticas propias de Hostelworld.com. Hostal Marsella cobrará el 50% del valor total de la reserva con 15 días de anticipación para formalizar la reserva, de haber cambios en el número de personas notificar con 72 horas de anticipación, si fuera de menor personas la comisión de Hostelworld no es negociable por sus políticas propias. Hostal Marsella is located in the northern center of Quito, favoring its location for ease of public transport and tourist attractions. Our rooms are cozy to meet the needs of our customers. It is a Colonial House and is run by an Ecuadorian family, has rooms with private bathrooms and others with shared bathrooms, all of which are simple and comfortable, we have been working approximately 38 years serving our customers. We have cafeteria services, laundry, book exchange, daily cleaning, we have a terrace with a great view and space or area for smokers. Our prices are cheap, do not expect a luxury service but if we offer personalized service where you will be very comfortable with our newly re-modeled facilities. 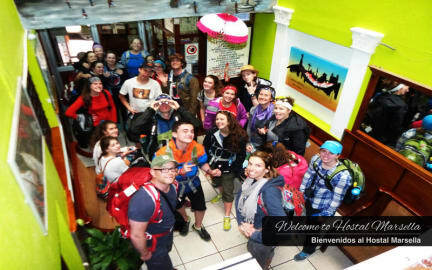 Besides the hostel it is in a place to rest and a good location so you can move more easily around the city. Very friendly staff. Helpful and in a good mood all the day. The hostel is very clean and safe. It's located just a few minutes from the old part of Quito. Next time I'm in Quito I will go here again. Quitos Straßen sind eng und verwirrend. Der Taxifahrer ist verwirrt umher gefahren bis wir es dann schlussendlich zu Fuß gefunden haben. Mitarbeiter waren nett und hilfsbereit. Rund um die Uhr war jemand am Empfang. Wifi hat gut funktioniert. Zimmer war sauber plus Terrasse gleich vor der Tür. Lage so-so. Public Transport in der Nähe Sicherheit in Quito ist so eine Sache. Selbst ein Polizist hat uns gewarnt, dass wir nach Einkehr der Dunkelheit lieber nach Hause sollten. Keep care.